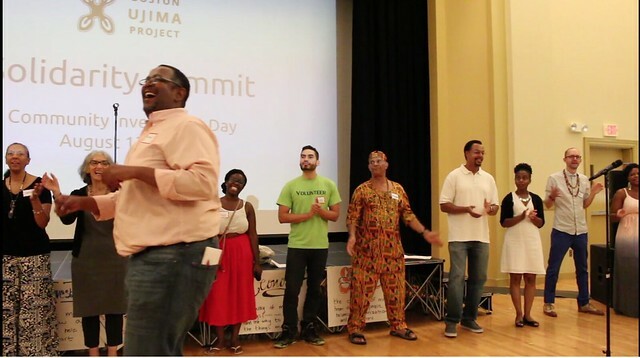 Boston Ujima Project was started in 2015 as a collaboration between several local grassroots organizations and local economy stakeholders. Combining some of the best alternative economic practices from around the world, the project is an economic democracy pilot based in Boston’s low-income communities of color. As a multi-stakeholder and multi-strategy initiative, Ujima has three main goals. First, Ujima seeks to integrate a range of innovative economic practices, including co-op development, neighborhood-based community planning, participatory budgeting, and alternative currencies into one cohesive local system. Through this system, Ujima aims to build wealth, knowledge and political power in communities whose labor and land have long been exploited & who continue to face systematic barriers to participating in the mainstream economy. Lastly, by designing and building this experiment of sorts, Ujima intends to pilot at a small scale the seeds for an alternative and non-capitalist economic system that can circulate and grow wealth in a way that centers the values and interests of local residents. About two years since its inception, the Boston Ujima Project has begun to democratically allocate investment funds to local black- and immigrant-owned businesses that embody the community’s aspirations and meet community standards around labor, ecology and ownership. This short video documents the exciting early stages of this process. It is intended to spread the word about Ujima to residents in the neighborhoods in which it is based—neighborhoods of color in Roxbury, Dorchester, Mattapan & Jamaica Plain. Post & Photo by Libbie Cohn.